This blower has a large cut into the cast iron. We used a grinding wheel to bevel halfway through, and made the repair with our 77 cast iron rod and a 130 mini amp welder. After making the repair we used a grinding wheel to smooth the surface, and the part was as good as new. For best results clean and bevel the cast iron before welding. Gently pre-heat the cast iron if possible, no need to get it red hot but it will lay flatter when you first start your bead and preheating removes moisture out of the cast to prevent pinholes. 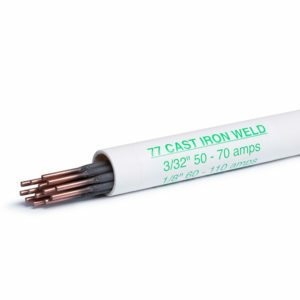 For welders that use nickel, use the same process you would with nickel as the MuggyWeld 77 rod will produce a superior result.